Jared Unzipped: By The Rain. I never considered the innocence of the rain until now. Virginal drops of life from feathery stewards in the sky bring it to us, without any regard for payment, nor gratitude. Watchful gardeners of the flesh, the clouds pour it own from the ceaseless firmament. The rain washes away the filth that crawls upon the walls of reality. 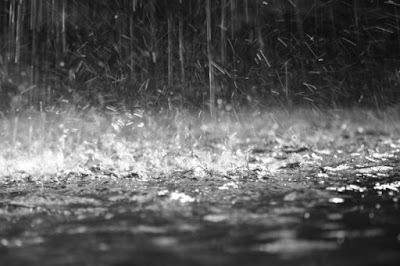 Indiscriminate and ever-lasting; rain shall always be with us. Upon us. Inside us. Forever. My mind wanders to the nether regions of the universe. Passing through nebulae and clouds of asteroids circling dying stars, a single world flirts with the edge of nothingness. There, on the last repeating frequency of tomorrow's tomorrow, exists a tiny clod of gnarled dust. Completely insignificant and without any semblance of respectability floats a planet not even worth forgetting. Scattered with shattered crystals and mountains of waste, this anti-Earth is simultaneously unique and disgusting. For you see... on this hellish landscape remains but a single drop of rain. As you can imagine, one speck of water doesn't go very far on a deserted world. Against all logic, year in and year out, millenia after millenia, the rain drop does its job. The mission for a single rain drop is clear: it must cleanse away the past. No matter how challenging the task before it, the rain drop will push on. Never will it give up. Never will it give in. Failure does not compute. The rain will fall, come what may. Bathed in the swirling stars of infinity, the single drop of rain slowly washes the muck away. Over and over again, it transcends from the ground to the sky. Rise and fall, rise and fall... in tandem with the universal heartbeat. No clockwork designed by man could be more accurate. For the rain drop, time is measured by how much of the past still remains visible. And yet, the rain also realizes that it is fighting a losing proposition. There will always be more of the past to wash away. Ten rain drops, a hundred rain drops... the difference is of no consequence. Even in the face of a never-ending conundrum, the rain does what it must do. And on this back-world of emptiness, the lone drop of rain pushes ahead, never coming to a stop. And the universe continues on. So you see, when we feel the rain fall upon our faces, whisper to it "thank you." Give the rain but a moment to rest. Have the decency to allow each and every droplet a chance to experience its work firsthand. How sad would it be if a chef never got to enjoy his own artistry? Alas, this is what we can offer back to the rain. Let the rain, in all its transparent majesty, understand its own immaculateness. A rare element indeed -- one of the few aspects of our known actuality that asks for nothing and gives everything. In this, I now measure innocence by the rain.